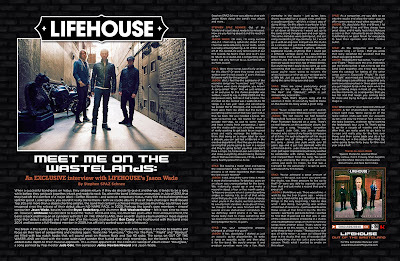 Discussions Magazine Music Blog: LIFEHOUSE's Jason Wade: An EXCLUSIVE interview! 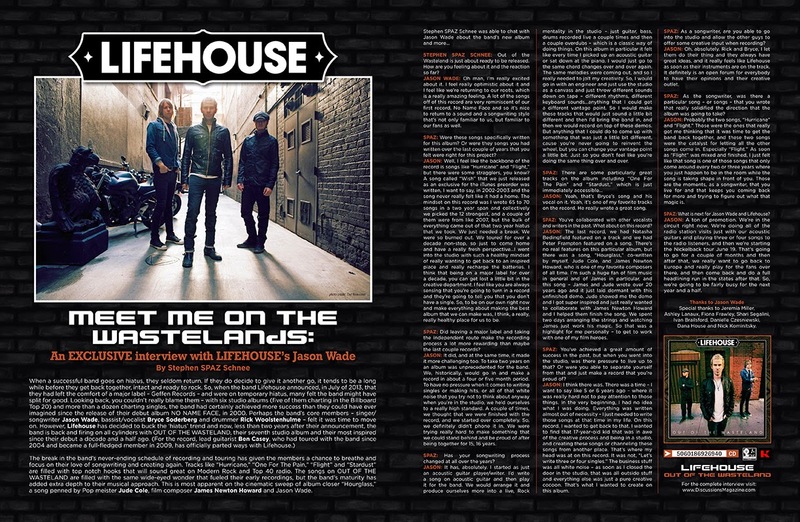 LIFEHOUSE's Jason Wade: An EXCLUSIVE interview! The break in the band’s never-ending schedule of recording and touring has given the members a chance to breathe and focus on their love of songwriting and creating again. Tracks like “Hurricane,” “One For The Pain,” “Flight” and “Stardust” are filled with top notch hooks that will sound great on Modern Rock and Top 40 radio. The songs on Out Of The Wasteland are filled with the same wide-eyed wonder that fueled their early recordings, but the band’s maturity has added extra depth to their musical approach. This is most apparent on the cinematic sweep of album closer “Hourglass,” a song penned by Pop meister Jude Cole, film composer James Newton Howard and Jason Wade. STEPHEN SPAZ SCHNEE: Out of the Wasteland is just about ready to be released. How are you feeling about it and the reaction so far? JASON WADE: We’re very excited about it! Very optimistic and feel like we’re returning to our roots, which is an amazing feeling. A lot of the songs off of the record are reminiscent of our first record, No Name Face... so it’s nice to return to a sound and a songwriting style that’s not only familiar to us, but familiar to our fans as well. SPAZ: Were these songs specifically written for this album? Or were they songs you had written over the last couple of years that you felt were right for this project? JASON: Well, I feel like the backbone of the record are songs like “Hurricane” and “Flight,” but there were some stragglers. A song called “Wish” that we just released as an exclusive for the iTunes preorder was written, I want to say, in 2002-2003 and the song never really felt like it had a home. The mindset was writing 65 to 70 songs in a two year span and collectively we picked the 12 strongest, and a couple of them were from around 2007, but most everything came out of that two year hiatus we had. We needed a break. So burned out… touring for over a decade non-stop, so just to come home and have a fresh perspective…I went into the studio with such a healthy mindset of wanting to get back to an inspired place and really recharge the batteries. I think that being on a major label for over a decade, you can get lost a little on the creative end. I feel like you’re always sensing that you’re going to turn in a record and they’re going to tell you that you don’t have a single. So, to be on our own right now and make everything about making the best album that we can make was, I think, a n extremely healthy place for us to be. SPAZ: Did leaving a major label and taking the independent route make the recording process a lot more rewarding than maybe the last couple records? JASON: It did, and at the same time it made it more challenging too. To take two years on an album was unusal for the band. We, historically, would go in and make a record in about a four or five month period. To have no pressure when it comes to writing singles or making hits, or all of that white noise that you try not to think about when you’re in the studio, we held ourselves to a high standard. A couple of times, we thought that we were finished with the record, and we started over completely. So, we didn’t phone it in. We were trying really hard to make something that we could stand behind and be proud of after being together for 15, 16 years. SPAZ: Has your songwriting process changed at all over the years? JASON: It has, absolutely. I started as just anacoustic guitar player/writer. I’d write a song on acoustic guitar and then play it for the band. We would arrange it and produce ourselves more into a live, Rock mentality in the studio – just guitar, bass, drums recorded live a couple times and then some overdubs – which is the classic way of doing things. On this album in particular it felt like every time I picked up an acoustic guitar or sat down at the piano, I would just go to the same chord changes over and over again. The same melodies were coming out, and so I needed to jolt my creativity. This time I’d bring in an engineer and just use the studio as a canvas, throwing different sounds down on tape – different rhythms, keyboard sounds...anything that would allow a different vantage point. So I would make the tracks sound a little bit different and then bring the band in, then we'd record on top of the demos. But anything I could do to come up with something that was just a little different, because let’s face it, you’re never going to reinvent the wheel, but you can change your method a little bit so you don’t feel like you’re doing the same thing over and over. JASON: Yeah, that’s Bryce’s song and his vocal on it. It’s one of my favorite tracks on the record. He wrote a great song. SPAZ: You’ve collaborated with other vocalists and writers in the past. What about on this record? JASON: The last record, we had Natasha Bedingfield featured on a track and we had Peter Frampton featured on a song. There’s no real features on this particular album, but there was a song, “Hourglass,” co-written by myself, Jude Cole, and James Newton Howard, who is one of my favorite composers. I’m a huge fan of film music in general and of James in particular, and this song – James and Jude wrote over 20 years ago and it just laid dormant with this unfinished demo. Jude showed me the demo and I got inspired and just really wanted to collaborate with James Newton Howard and I helped them finish. We spent two days arranging the strings and watching James work his magic. So that was a highlight for me personally – to get to work with one of my film heroes. SPAZ: You’ve achieved a great amount of success in the past, but when you went into the studio, was there pressure to live up to that? Or were you able to separate yourself from that and just make a record that you’re proud of? JASON: I think there was. There was a time – I want to say like 5 or 6 years ago – where it was really hard not to pay attention to those things. In the very beginning, I had no idea what I was doing. Everything was written almost out of necessity – I just needed to write those songs at that time in my life. On this record, I wanted to get back to that. I wanted to find that 17-year-old kid that was in awe of the creative process and being in a studio, crafting or channeling songs from another place. That’s where my head was at this time. It was not, “Let’s write three or four singles.” The business stuff was all white noise – as soon as I closed the door in the studio, that was all outside stuff and everything else was just a pure creative cocoon. SPAZ: As a songwriter, are you able to go into the studio and allow the other guys to offer some kind of creative input when recording? JASON: Oh, absolutely. Rick and Bryce do their thing and they always have great ideas, and it feels like Lifehouse as soon as their instruments are on the track. It’s an open forum for everybody to have their opinions and their creative outlet. SPAZ: As the songwriter, was there a particular song – or songs – that you wrote that really solidified the direction that the album was going to take? JASON: Probably the two songs, “Hurricane” and “Flight.” Those were the ones that really got me thinking that it was time to get the band back together, and these two songs were the catalyst for letting all the other songs come in. Especially “Flight.” As soon as “Flight” was mixed and finished, it just felt like one that only comes around every two or three years where you just happen to be in the room while the song is taking shape in front of you. Those are the moments, as a songwriter that you live for and that keeps you coming back for more, trying to figure out what that magic is. 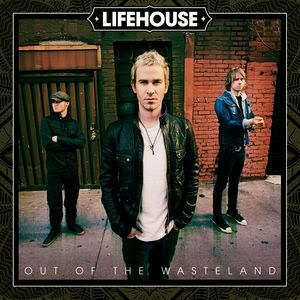 SPAZ: What is next for Jason Wade and Lifehouse? JASON: Some promotion. We’re in the circuit right now. We’re doing various radio station visits with our acoustic guitars, playing three or four songs to the radio listeners, and then we’re starting the Nickelback tour June 19. That’ll go for a couple of months, then we want to go back to Europe and play for the fans over there. After that we'll come back and do a full headlining run in the states. So, we’re going to be fairly busy for the next year and a half. Special thanks to Jeremia Miller, Ashley Lanaux, Fiona Frawley, Shari Segalini, Ivan Brailsford, Danielle Czesniewski, Dana House and Nick Kominitsky.